This isn’t a traditional recipe. This is a quick and dirty (read: easy and yummy) version of a hot soup made with soba noodles topped with deep fried tofu. 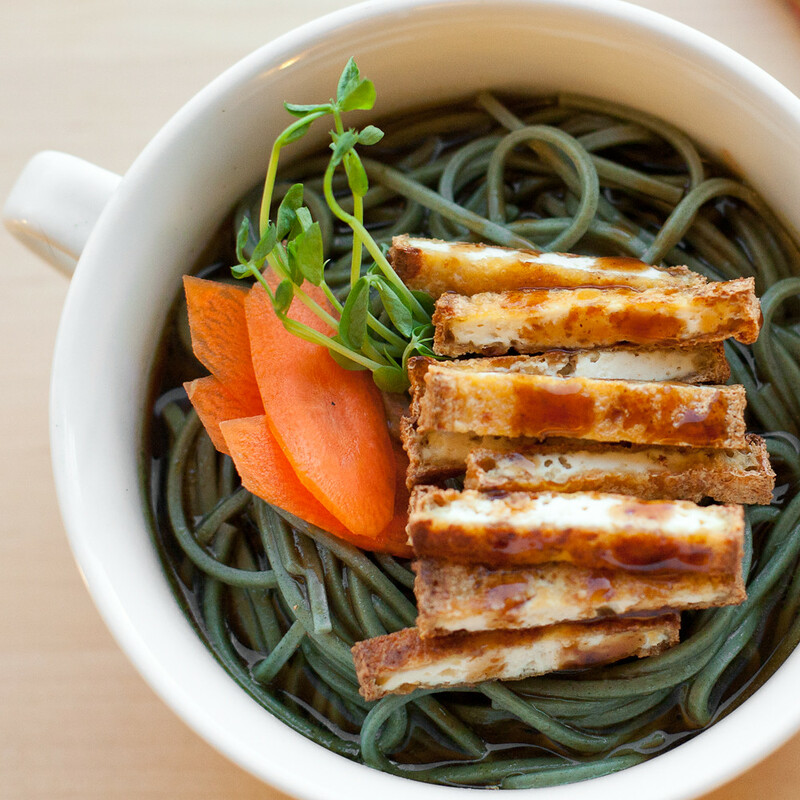 Putting fried tofu on top of soba noodle soup makes it kitsune soba. Kitsune means fox in Japanese, and folklore says fox spirits are quite fond of fried tofu, hence the name “fox soba.” It’s delicious. I like recipes that are flexible. Once you have the broth, the noodles, and the tofu, you can add whatever else you want on top. I chose to go light and easy, a few fresh pea shoots and thinly sliced raw carrots. Then I topped everything off with Bull Dog Sauce. I’m pretty sure you’re not supposed to put Bull Dog Sauce on soba noodle soup. But I did, and it was good, and no one yelled at me, so I’m pretty sure you can do it too if you want. It’s sort of a like a Japanese steak sauce/bbq sauce. There are many different variations, but I used the Fruit and Vegetable Semi-Sweet version. You can find it at any reasonably stocked asian grocer, or you can get it online here. 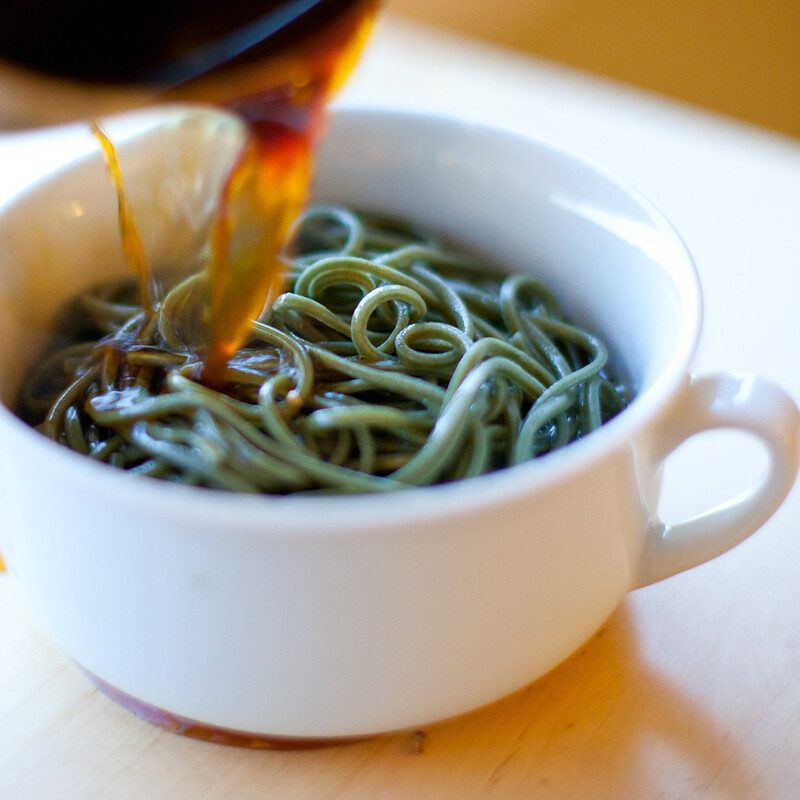 So, here’s the thing about my version of kitsune soba. The flavor is anchored in the salty, sweet, gingery broth. The tofu and vegetables are there mostly for contrasts in color, texture, and temperature. Since everything is presented plain, the broth does most the heavy lifting in the flavor department, but it also allows the raw ingredients to shine on their own. Add all the broth ingredients to a small pot and bring to a boil. Turn off the heat and place a lid on the broth while preparing the rest of the meal. This allows all the gingery goodness to steep into the broth. Place a pot of lightly salted water on to boil. Meanwhile, heat a cast iron or non-stick pan with oil, just enough to cover the bottom of the pan. 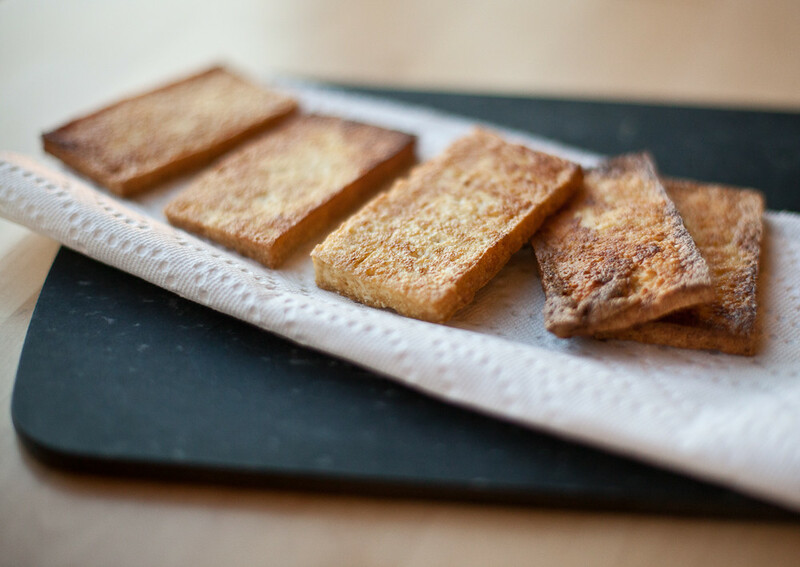 Fry the tofu slices for several minutes on both sides until golden brown and very very crispy. Drain on a paper towel. Once the water is boiling, add noodles and cook to package directions or until noodles are tender. My noodles were done in only 4 minutes, but the package said 6-7 minutes, so check them early to avoid over cooking. Drain the noodles and rinse with cold water. Place the noodles in bowls and pour the hot broth over them, straining out the ginger pieces. Top with the fried tofu, sliced, as well as your vegetables and greens. Garnish with Bull Dog Sauce, if using. You can easily make every part of this ahead, so this is a nice option for company, and it looks fancy too! WOW that last picture looks crazy good!! I love noodles. I love tofu. Together they are a match made in heaven. I’m just curious, but is the Bull Dog Sauce vegan? Yes! I haven’t read the ingredients for all the formulations, but the one I used is vegan. Really? Great, I have to get one next time I go to an Asian store! Thanks for the info. I’m so excited now :) The one you liked to is my favourite! As a non-vegan kid, I always used the Bull Dog Sauce to eat breaded, deep-fried pork and some seafood, so I’ve never thought the sauce itself can be vegan. Yeah! I can’t wait to try it on katsu tofu! This looks just like the kind of soup I love. I never heard of Bull Dog sauce, but what a name! Hi Lolo, I have an award for you over at my blog! Your food looks awesome as ever!! Wow – those noodles are an amazing colour. Looks great! The color depends on how the noodles are made. I just found this cute comic that explains why soba noodles are different colors. Question: did you press the tofu at all? If so, did you slice the tofu before or after you pressed? Your slices look so thin and uniform…mine are usually pretty misshapen. Hey Kathryn! I pressed the slices briefly, after cutting, on paper towels. I literally placed them on a doubled paper towel and then pressed down with my hands on top with another paper towel for just a few seconds – so it wasn’t a formal pressing. You choose not to press them and it will work fine, but they will take slightly longer to cook. Sorry—I forgot to say—thanks for all the pictures, the meal looks yummy! Have you tried cooking the noodles with the broth? It appears much simpler that way. BTW I’m so happy you are back! I’ve missed you. I can’t wait for more of your easy fun recipes and maybe even a new cookbook…. I was worried it would be too salty but I might try it next time! Never heard of Bull Dog sauce or of green soba noodles. Sounds so interesting! This looks wonderful! I too have found that ginger is really lovely in broth soups, and this looks great for an autumn/winter recipe. Wow, this looks amazing! I can’t wait to make it! I’m always looking for a quick soup recipe for those busy cold days. Thank you! This looks really tasty! I’ve never tried Bull Dog Sauce…interesting! I make a similar broth with kombu, dried mushrooms, fresh ginger, scallions, toasted sesame oil and tamari. I fry my tofu in coconut oil after seasoning it with garlic. Yours looks great! Nice photos! 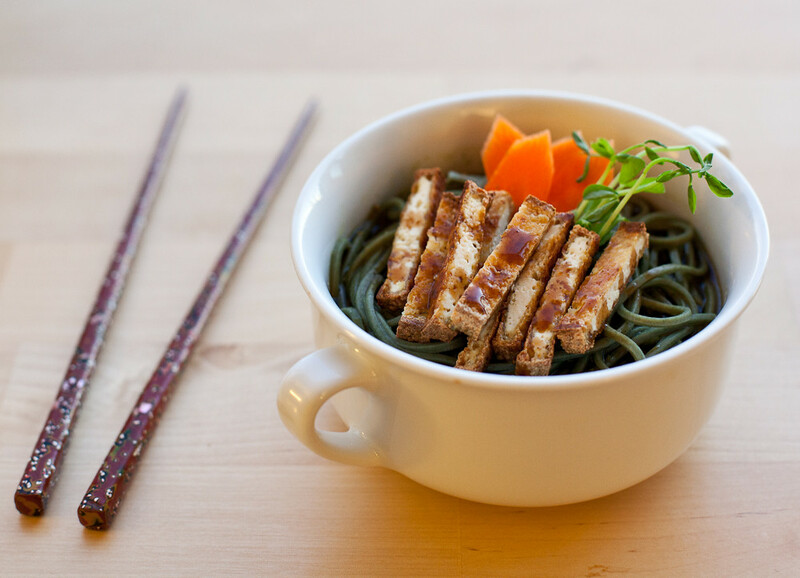 All about noodle bowls during these cold, cold months. But! Wheat irritates my belly. Hopefully brown rice (stir fry-type) noodles will suffice. Happy Thanksgiving. It is good to see you popping up now and then. Thanks for all you do.